If you’re used to hearing Ferdinand David’s version of this piece, this 1956 recording by Belgian violinist Arthur Grumiaux (1921-1986) will offer some surprises. Grumiaux returns to the original manuscript, archived at the State Library of Dresden. Interestingly, this version seems to be the most harmonically adventurous, with some fairly shocking modulations. Jelly d’Aranyi (1893-1966) was a Hungarian violinist who emigrated to London. She performed recitals frequently with Béla Bartók who dedicated his two violin sonatas to her. Her performance of gypsy fiddle music inspired Ravel’s Tzigane. Vitali’s Chaconne opened the 16-year-old Jascha Heifetz’ Carnegie Hall debut recital in 1917. This 1950 recording features Ottorino Respighi’s arrangement with organ accompaniment. 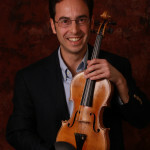 Beginning in 1922, Heifetz played a 1740 Guarneri del Gesù violin which was owned by Ferdinand David. Here is a rare 1975 recording by the American violinist Eugene Fodor (1950-2011), who won the top prize at the International Tchaikovsky Competition in Moscow in 1974 at the height of the Cold War. Will the Real Tomaso Antonio Vitali Please Stand Up?